It seems that every culture has it’s morning jump-start beverage— coffee, origination in Africa; tea from China; yerba maté imbibed in temperate South America, and chocolate which 500 years ago radiated out to the world from Central America. These plants contain caffeine and chemically-related stimulating alkaloids. Depending on preparation methods, all have their own variations on healthful antioxidants. Europeans adopted these beverages with further refinements. But what happened to North America’s—yaupon holly? Like other morning beverages, yaupon is loaded with antioxidants, and is the only plant from North America that contains caffeine. Like yerba maté, it is a member of the genus Ilex (hollies). You can buy evergreen, red-fruited yaupon hollies at almost every nursery in the South. Common in forests of south Arkansas, it evolved in the Ouachita Mountains, then spread throughout the Southeast. English naturalist, Mark Catesby (1682-1749) author of The Natural History of Carolina, Florida and the Bahama Islands published from 1731-1742, describes a cleansing ritual in which on one day a year, all of a tribe’s members drank black tea to induce “spring cleaning” (vomiting). Yet, the other 364 days of the year, an infusion of yaupon leaves was drunk like we drink coffee or tea in the morning. Today yaupon is making a come back. Now you can do an internet search for “asi tea” or “yaupon tea” and instead of references to historic literature, you will discover several small companies offering teas and beverages from the yaupon holly from Texas to Georgia. Well-established as a beverage tea after the American Revolution, the Civil War seems to have disrupted sourcing in the South and relegated the plant’s use to history until now. Confused botanical nomenclature, finally clarified in 1949, may also have impacted perceptions about the plant. Since 1949, the accepted scientific name, bestowed on the plant in a work by English botanist William Aiton in 1789, lives in infamy— Ilex vomitoria. 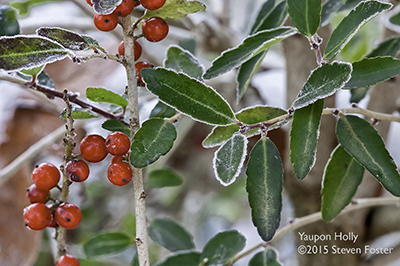 Here’s my photo gallery of yaupon holly images.